Large Antique BACCARAT French Ruby Glass Perfume Casket with Fine Fancy Dore Bronze Mounts, Double Loop Handles and 4 Ball Feet. The Inside Encasing 6 Perfume Bottles and Stoppers. Each Perfume Bottle has a Dore Bronze Top Depicting the Typical Flower used By Baccarat and Inside Stoppers. 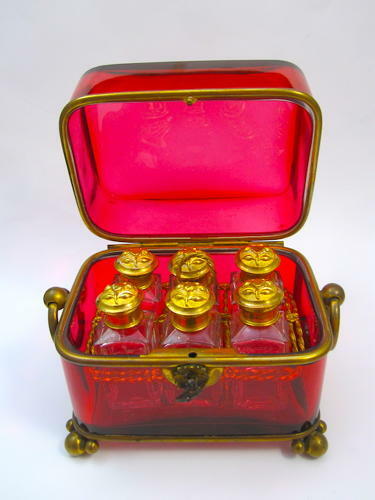 Wonderful Baccarat 6 Perfume Bottle Casket ! They are Becoming Increasing Rare to Find !